The crib's plastic hardware can break, which can cause the drop side of the crib to detach from a corner of the crib. This creates a space into which an infant or toddler can roll and become wedged or trapped. The crib's mattress support also can detach from the crib frame, creating a space in which a child could become trapped and suffocate or strangle. 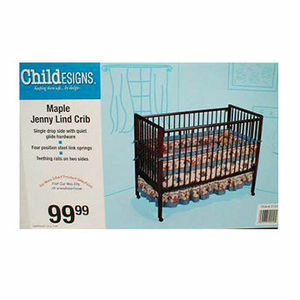 Although Generation 2 went out of business in 2005, it is believed that there were more than 500,000 of these recalled cribs sold to consumers. All Generation 2 Worldwide and "ChildESIGNS" drop side cribs are included in this recall (some of the known model numbers are: 10-110X, 10-210X, 21-110X, 20-710X, 64-315X, 26-110X, 90-257X, 20-810X, 46-715X, 64-311X, 74-315X, 21-815X, 21-810X, 20815X, 308154 and 54915; the "X" denotes where an additional and varying number may appear at the end of the model number). The cribs were sold at numerous local furniture and retail stores including Buy Buy Baby, Kmart, and Walmart nationwide for between $60 and $160. Stop using these cribs immediately and find an alternative, safe sleeping environment for your baby. Do not attempt to fix these cribs. Consumers should contact the store where they purchased the crib for remedy information, which will vary between a refund, replacement crib or store credit, depending on the retailer.